I've always been a writer. In 3rd grade  I was thrown outside class for some reason and was sitting on a bench, probably frowning inside over Ms. Kingo who was my teacher and my daemon. Few minutes later a guy from the other 3rd grade class arrived at the same bench for the same reason. His name was Mogens Gårdsmann. I was writing on a magazine with jokes at that time that I wanted to publish, and Mogens Gårdsmann who sat next to me turned out to be good with drawings. So we made a joint venture right there and few months later our first magazine, Lattermedicin [Laughter Medicine], was published and sold in local kiosks and comics stores. It had developed from the original idea so that it also contained 4 pages with a comic we had done together, "Rin tin tin." We did a magazine number two also but as we had now learned all the mechanics about typesetting, printing, distribution and so on, it was down to normal boring business - and didn't look like becoming a prosperous business either. We had developed an interest for comics. So instead of publishing more magazines we turned to comics production in my room at my mothers house (because I had a drawing table). The work would normally be performed in the way that we would joke around verbally and physically like in a cartoon, mocking up figures and stories, agree to some sort of story board and then rush to the drawing table where I would draw up the frames for the pages which Mogens would then make pencil drawings in, whereafter I would ink the drawings and write the text nicely and readable. 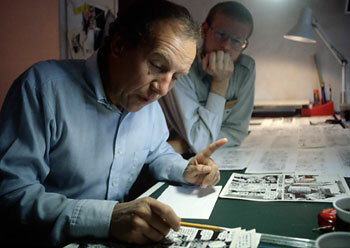 The major problem in comics is that it is lengthy work to get something produced! To give an idea on how lengthy a process it is: The pencil drawings on the page might have taken 1 to 2 days for Mogens to do and then it would take me 2-4 days to ink them and finish it. Sometimes even more as we developed all sorts of fancy techniques with markers, Letraset dots and so on. Another thing is that it is also nice to play chess and to mock up new stories and jokes. And when you have the story, all there is left is to get the work done. And that is the hard part. It is fun in the way that it is a developing process where you get better and better in what you do, and that you really ARE your characters and the buildings and such that you draw. So we spent a lot of time BEING the paper, the ink, the persons, the cars, the chairs and such that we were drawing. We had our own little universe going there. However, the whole process is so developing that when you would work on a 48 page album, you would look back after finishing page 8 - and then you wanted to redo the first pages because the last two pages looked so much better than the first ones. Both the characters, the story and the technical aspects. One day Mogens came up with a bright idea: If we do comic stripes we would be able to work on several types of series simoustanely and also get to actually finish some stripes. So we did that and actually got a lot of things finished. We had a doctor series, a musketeer series, a stoneage series and some others. Getting it published was another story. The comics scene was a bit suppressed at that time. There was a lot of French, Belgium and American comics being translated into Danish and published but very few Danish. Actually at that time most comics was stripes such as "Poeten & Lillemor" by Jørgen Mogensen, "Alfredo" by Cosper Cornelius (who's Granddaughter, Charlotte, I was funny enough married to for 12 years from 1990 to 2002) and few others. Those comics was running in newspapers and weekly magazines for women so from our viewpoint our work wasn't even vaguely related to it. There was also being developing a major project to produce a Danish comics, VALHALLA that could be the Danish Tin Tin or Asterix. It was a project initiated by the Danish publishing house Interpresse who found the people to produce the comic which one of their own editors was writing. 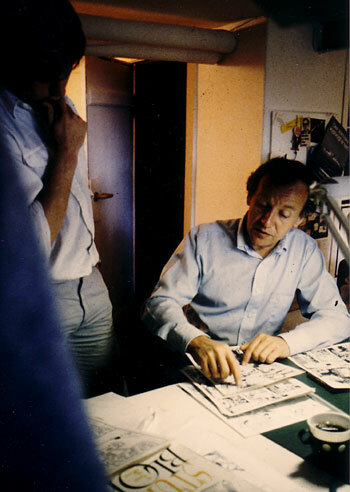 The key figure in this project was Peter Madsen who was the first "real" Danish comics drawer to make a living of drawing comics. From about 1980 and onward this project was the forefront of the Danish comic world and opened up a Golden Age that lasted till about 1987 (when most comics became more or less adult comics in the semi-pornographic sense). Anyhow, we - or especially I - made it a game to get things published. We made a magazine for the 3 publishers in Denmark where the tone was harsh and we were teasing them that they should open their eyes on our work and publish it. The wrong thing about this was that we had never spoken to them. So to open up the communication by insulting them maybe wasn't as smart as it was sure fun to do. We never got anything published there! Newer! They didn't even write us a letter. Instead we got some comic stripes published (and actually paid very well) in a Scandinavian magazine that was published from Lund in Sweden. It came out in Finland, Norway, Sweden and Denmark. The name of it was "Super" and it was mostly a rip-off of MAD. 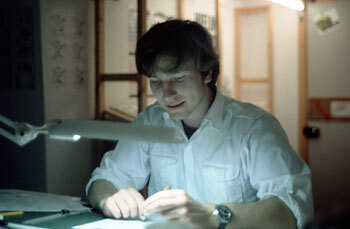 In 1982 a young guy (17 years), Johnny Heinmann, started a publishing house with three of his school friends. 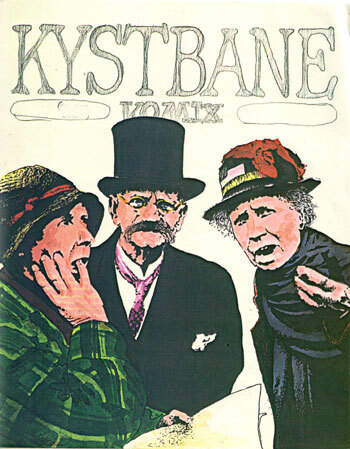 They were to publish the magazine "Danske Tegneserier" [Danish Comics] that would contain work of Danish comics drawers only. We got into this project from the beginning and had some pages in each issue. The truth of the matter was however that we were school kids then and didn't pay much interest to the business side of it. 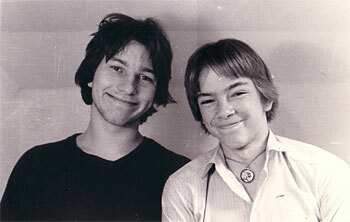 We had a crack making the comics and that then was what we concentrated on. We also got to play a lot of chess in-between, smoked pipe at that time (we weren't allowed to smoke cigarettes by our parents so we never did ;-). 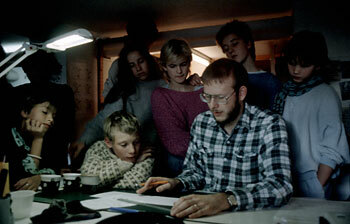 From 1980 we called out teamwork "Tegnebordet 80" [The Drawing Table 80] - somehow the concept of making companies was in the blood already then. We were pretty much alone with our interest it seemed. 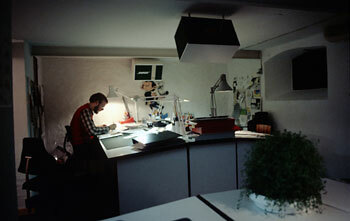 There was a comics drawing office in Copenhagen called Gimle where 5 people worked. Some of them full-time doing Donald Duck and other work that you could make a living of, and one of them had published his own albums at that time. The VALHALLA project was also done at this studio. So we got the idea to make a comics drawing office in Århus where we could get like-minded people to come and work, as well as making it a place for comic fans to hang out. Probably via the "HÅRD KOST" network we got Lars Dahl, Ole Okkels and Peter to join us in renovating my mothers cellar from 1872 into a drawing office. As there was only 174 cm. to the ceiling the name for it was to be "Hjelm Påbudt" [Wear a helmet]. We would be sitting down anyway! 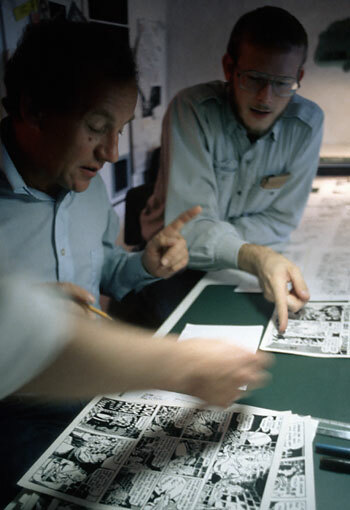 So we opened up the "Hjelm Påbudt" and in a matter of few months we were a hard-core group of Mogens, Lars Dahl and I making comics in the evenings and every Sunday. The Sunday was mandatory, the other days could vary. Lars was in the mid-twenties then while we were still teenagers. So he learned us to love Genesis, Lou Reed and other adult music we had else not been in touch with. We worked in silence, listening to the music, sometimes talking and joking while doing our thing and drank a lot of coffee. 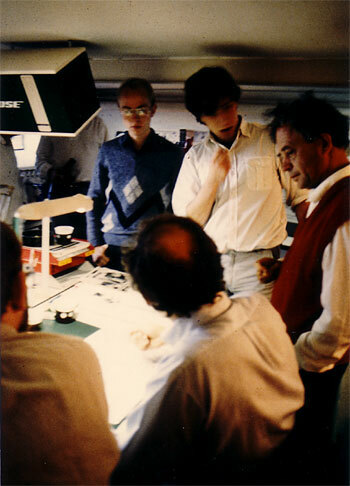 Pierre Christin (text) and Jean-Claude Mézieres (drawing) who is known for their Linda & Valentin comics visited Hjelm Påbudt in 1986.On this picture they are surrounded by Lars Dahl, Poul Petersen (comic drawer from Sønderjylland) and Mogens Gårdsmann. There was also some journalists and photographers in the background. 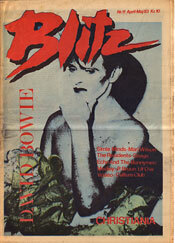 I was also soon into writing articles about comics in the monthly magazine on sub-culture, Blitz. 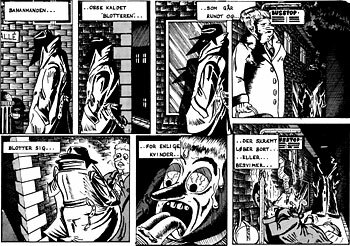 I took over the comics editor posts at one stage and then also edited four pages of danish comics every month, did interviews with comics drawers such as Runt T. Kidde, Peter Madsen, publishers and so on. And also wrote articles on the technical aspects of making comics (tools guides, how to, etc.). I was then in 10th grade in school and later in business school and would mostly rush home in the mid day break to check my mail for new comics from the publishing houses for review, original comics from drawers and other stuff. I got everything that was being published sent to me for free in that period which added somewhat three meters of comics to my collection. Call it destiny. 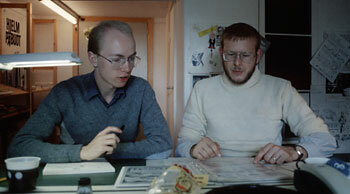 Once I did an interview on a person who had been the driving force in the Danish comics world in the 70ties. One day he just stopped talking to the people he used to in the comics world, stopped buying and reading comics, and instead started running an organization for bicycle interests. I thought of it like treason at that time, probably around 1983. I was really upset by the fact that someone could just turn around like that! In 1985 Mogens and I had finished our school and was about to finish our educations. He was a buildings painter, I was working on a timbermill. Both trades far from what we had expected in life. So we talked about this and decided that we wanted a future that was fun, easy and prosperous. And as we couldn't live of making comics, we decided advertising was it. So in September 1985 we started "A-Z reklame" [A-Z advertising] in the same cellar where the "Hjelm Påbudt" was, and added a darkroom in the building next door. After just three months Mogens confessed that he didn't like the advertising business - it was to few drawings and to much business. In half an hour we had decided that I would take over the company and he was free to leave. And from that moment I actually skipped reading comics, making them, writing about them - and was out of that world. Just like the guy I had written about few years earlier and whom I thought of as a treasoner. Call it destiny. It was the end of "my secret life." I wasn't mad at anybody or such. I just had enough work doing advertising and probably that work fulfilled my interst for working with ideas and graphic elements. 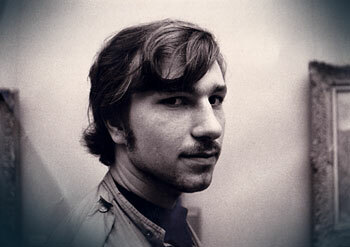 Mogens Gårdsmann (1965-)worked on several advertising agencies in town for some years and ended up with his own drawing office www.gills.dk where he did airbrush illustrations and the like on computer for somewhat 5 years. All the time he made comics on the side and got some published. 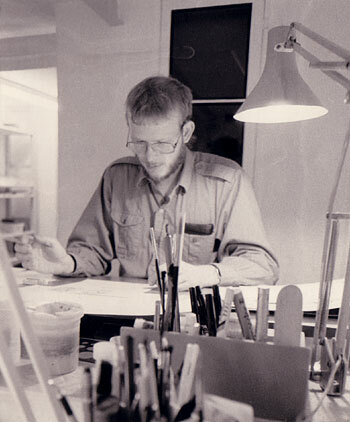 In the end of the 90'ties he divorsed from his Norwegian wife and moved to Australia where his brother had been living for the last ten or fifteen years, but returned to Aarhus and Herning in Denmark and worked for LEGO with animations and illustrations. 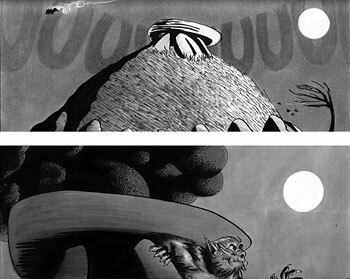 Johnny Heinmann (1965-)closed down the publication "Danske Tegneserier" with a heavy loss and then started publishing of traditional books and childrens books untill 1987 when he came and started working with me in the advertising agency and a publishing house I had started also. Since 1990 he has been building a successfull market analysis company, Analysegruppen A/S in Silkeborg, Denmark. [ www.analysegruppen.dk ] and also entered politics. Morten Hesseldahl (1965-)went on with a career in culture, as a writer, CEO of the Danish newspaper Information, chairman of the board of The Danish Film Institute, member of the DR executive branch (Danish national television), CEO of The Roal Theathre in Copenhagen and CEO of the Danish publishing house Gyldendal. 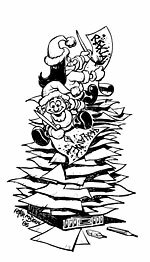 Peter Madsen did this drawing for my christmas cards in 1986. 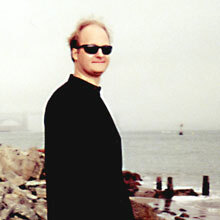 Henrik Rehr (1964-), who worked closely with Johnny Heinmann on "Danske Tegneserier" back in the 80ties, today lives on Manhatten with his wife and their kids. He did a comic, "TUESDAY," about September 11 as he lives just next to and experienced it first hand. And then he has been doing the comic strip Ferdinand which he took over some years ago after that Ferdinands "father" died. 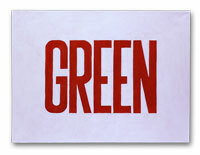 He also paint and have held several exhibitions. Peter Maltha Continued as illustrator and painter. Thorsten Overgaard (1965-) continued with advertising after the Hjelm Påbudt and into dot.com from 1995. In 2000 he sold his business to Execon and became an investor, writer and pohotographer, traveling around the world to more than 25 counties a year. He eventually moved out of Denmark and lives between Hong Kong and USA with his American wife, recording artist Joy Villa. - Thorsten Overgaard, Lido de Spina, Italy, July 2002.